Andrés Carrasco chose another path: to question the model of corporations and governments, and he decided to walk with campesinos, fumigated mothers, and peoples in struggle. There was no assembly where he was not mentioned. There are no papers, no scientific magazine, or academic conventions that allows one to go where he went, thanks to his commitment towards the people: Andrés Carrasco already has a place in the living history of those in struggle. Emilio Spataro, an organizer in Corrientes, has been active in various movements in Argentina since his teen years. He was a part of the popular rebellion in December of 2001 and the subsequent neighborhood assemblies, building occupations and horizontal self organized projects. Since 2009 he has been living in Corrientes, collaborating with territorially based movements. The Bachillerato Popular and the Cooperative are part of Ñanderoga, the social organization located in Las Flores neighborhood, in the district of Vicente López, north of Greater Buenos Aires. Ñanderoga, established in 2004, sets out to organize around cultural, social, and educational activities in an impoverished neighborhood of a wealthy district — a reflection of the so-called paradoxes of a painfully unequal Argentina. Residents of a town in Argentina have won the first victory in their fight against biotech giant Monsanto, but they are still at battle stations, aware that winning the war is still a long way off. For four months, activists in Malvinas Argentinas, a town in the central province of Cordoba, have maintained a blockade of the construction site where the U.S. transnational company is building the world’s biggest maize seed treatment plant. Following Argentina’s economic crisis in 2001, the country leaned heavily on mining and large-scale agribusiness (especially soy) to reinvigorate its ailing economy. The expansion of these industries requires the accumulation of new lands and the violent displacement of rural communities. Many farmers and indigenous communities don’t have titles to their lands, leaving them vulnerable to displacement or criminal charges for squatting. As new potential fracking investments appear on the horizon, so do community protests, mostly from indigenous groups fearing the same sort of environmental problems witnessed in other countries that ventured into non-conventional shale gas extraction. The Mapuche tribe of the Patagonia Region, where most of Argentina’s shale gas reserves lie at Vaca Muerta, are staunchly against fracking and insist that Argentina should uphold its commitments to ILO Convention 169, granting indigenous peoples the right of consultation before large investment projects move forward. Vanina Barboza Vaca from the Malvinas Assembly said that the town is a city “besieged” by fumigation, which has seen repeated spontaneous abortions, birth defects, cancer and respiratory diseases. “We know the evils of the model representing Monsanto. We also know that their promises are lies and so we refuse to allow them to install in our neighborhood 200 silos of transgenic seeds treated with agrotoxins,” warned Barboza Vaca. There are no prisons for autonomy. There are no situations that make it impossible. 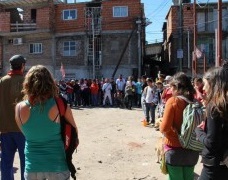 The experience of the Corriente Villera Independiente in Buenos Aires’ Villa 31 demonstrates that even in the most difficult of material conditions, even going against the current, autonomy can be placed at the center of collective community building. A small town in Patagonia is at the heart of the anti-mining struggle in Argentina. Ten years ago it voted against a proposed gold and silver project, and now – a decade later – it has mobilized to reaffirm it’s rejection of mega-mining projects.